Earlier this year, when Miley Cyrus debuted her Elvis arm tattoo, we mentioned a rumor that the pop star may have also gotten a “leetle” tattoo at Fun City Tattoo in Manhattan on March 30, with Flaming Lips frontman Wayne Coyne, a good friend of Miley’s with whom she has gone under the needle numerous times. Well, it turns out that rumor is true, and in a recent Instagram photo posted by Miley herself, you can see a small “leetle” tattoo inked on her left arm in black capital letters. In the same photo, the singer also revealed a “Moo” tat and a “WA” tattoo inked inside a heart, both on the same arm. It was during the Terry Richardson debacle that had Miley Cyrus distancing herself from the celebrity photographer, that she was apparently overheard talking about getting a tiny “leetle” tattoo at Fun City Tattoo on St. Mark’s Place. 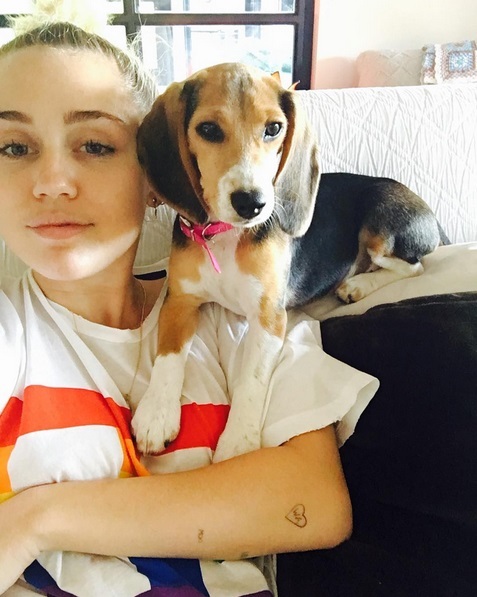 She reportedly got her arm tattoo with Wayne Coyne, who already shares quite a few matching tats with the inked-up pop star, including a piece dedicated to Miley’s late dog, Floyd, who was killed in a coyote attack in 2014. For those of you trying to figure out what in the world “leetle” means, our guess is it means “little” in the Miley-speak, a cutesy language that floods the star’s Instagram page and that likely inspired her “Biewty” arm tattoo. Miley Cyrus’ “leetle” tattoo is inked on the outside of her left forearm, in almost the same spot as the “love yer brain” tat she has inked on her right forearm. The pop star is apparently all about balance, because in the same Instagram photo where she revealed her “leetle” tattoo, she also showed off a heart tattoo near her left elbow with the letters “WA” inked inside, and this piece matches the “Elvis” heart tattoo she had inked near her right elbow in April. Miley had her “WA” heart tattoo done over the summer, likely in July, just after getting her “baby” Jupiter tattoo. At this point, Miley Cyrus’ arms are just covered in tiny tattoos, and another previously-unknown piece the singer had inked on her left arm is a tiny “Moo” tat, located right near her “leetle” tattoo. Miley’s “Moo” tattoo may have been inked as long ago as last year, courtesy of Australian tattoo artist Lauren Winzer, who is responsible for a number of Miley’s tattoos, including her avocado tat, a portrait of a cat, and an alien on her finger. Miley’s “Moo” tattoo has shown up quite a bit on her Instagram feed, but it wasn’t until she was photographed at Variety’s Power of Women Luncheon a couple of weeks ago that we could make out what the ink actually says.